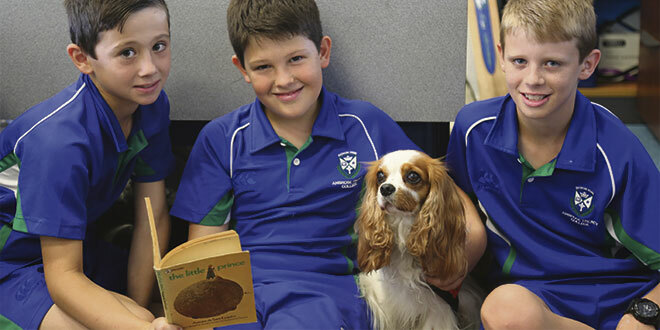 STORIES have come to life in Brisbane teacher Alicia Madigan’s Year 5 class with the addition of a new reading buddy – a furry friend named Archie. 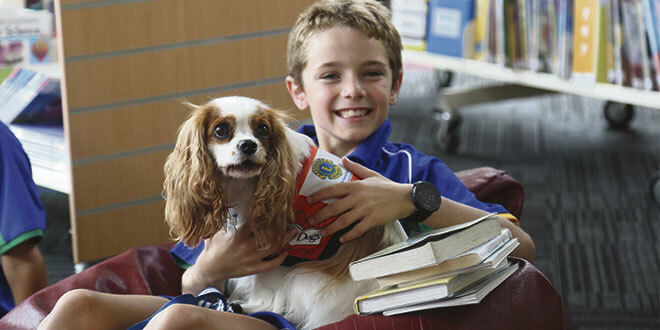 Archie is a four-year-old cavalier King Charles spaniel who works in the Story Dogs program, a not-for-profit organisation that helps children to improve their literacy skills. Each Wednesday Archie puts on his extra-small orange uniform and heads down to Ambrose Treacy College with his owner Ms Madigan. One of the boys Archie sits with, Fergus O’Connor, said Archie loved all sorts of books. “Archie just likes to read any book as long as he’s interested in it and, so long as he’s interested in it, he’ll like it,” he said. Fergus said Archie enjoyed it when people read with expression too. “It’s just easier for us to learn. Because I’ve got dyslexia it’s a lot harder, but when he’s here it’s easier because I have someone to read to,” he said. Fergus said that when he read to a teacher, it could be difficult because they would comment occasionally and correct the words, but Archie just listened and did not make any comments. “He’s a good listener,” he said. Fergus and his friends write their own stories to read to Archie, who apparently loves funny stories. “I used to have a pug, but he died,” Fergus said. “I miss him, so that’s why I like to hug Archie a lot because it reminds me of him. Ms Madigan said it all started when she took Archie out for walks. “Every time we came across a kid I would have to stop and he’d say hello to this kid and that kid,” she said. Ms Madigan trained Archie through the Story Dogs organisation and, after a check-up at the vet, Archie was off to reading sessions at Ambrose Treacy College. “He comes to TILT (targeted intervention literacy teaching), which is our reading support program that runs on Wednesday in the afternoons,” she said. Loyal friend: Will Beckman sitting with Archie. Photo: Joe Higgins. It’s not just in reading that Archie has found a place to help out in the classroom, but in the writing too. “The kids have written lots of stories about him,” Ms Madigan said. “We’re writing narratives in Year Five and he’s a really good stimulus for them. “All the adventures Archie’s been on in the stories – we’ve had Archie flying; we’ve had him eat lots of things in the school. Ms Madigan said Archie helped the boys learn about audiences in their writing. The creative diversity in the boys’ writing topics had opened up since Archie started attending class. Ms Madigan said since having Archie around she had read all sorts of stories about adventure and inventions coming from the boys. “I’ve never seen such engagement from boys wanting to read; we love Wednesdays, it’s our most productive day of getting work done,” she said. Archie doesn’t have a definitive favourite book, but Wet Dogs, a book featuring images of wet dogs was on the shortlist – Ms Madigan said he liked any story with dogs in it. Archie is one of many dogs in the Story Dogs program, which runs on a system of sponsorship. Ms Madigan said Archie was sponsored by Brisbane Ekibin Lions Club, but there were many dogs out there who were still searching for a sponsor. Story Dogs has been running since 2009 and is available to all primary schools in Australia, so long as there is a sponsor and a dog in the surrounding community.